Are you sick of my pistachio packed posts? 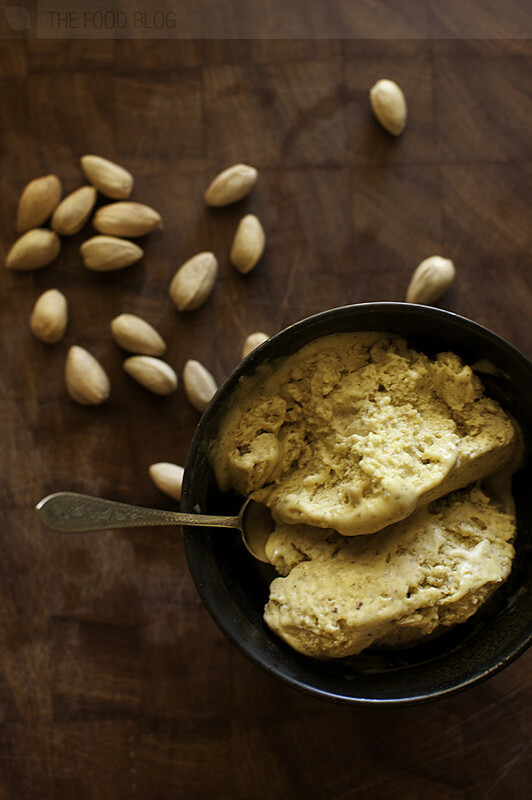 I don’t blame you, but really, this is a follow up on my obsessive post on Bronte pistachio paste, so bear with me and you will learn the easiest way to make ice cream, ever. Now that I had finally experienced what a jar of pistachio paste from Bronte tastes like (bloody amazing), I seriously needed to do something about the low supply situation. A visit to my Greenacre-based Lebanese green grocer Abu Salim provided a good kilo of roasted unsalted pistachios for $15.00. 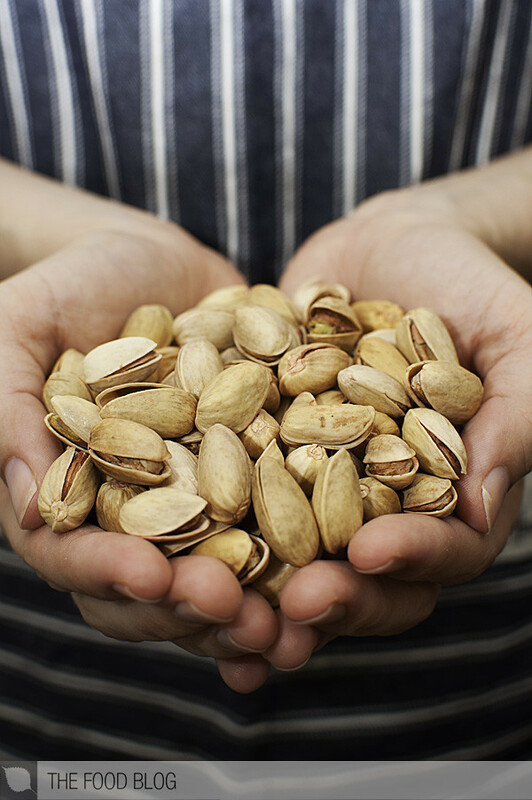 I wouldn’t call us a perfectionist race, but when it comes to roasting nuts, the Lebanese are masters – they get it so right. The nuts were wonderful; the roasting concentrated and amplified their flavour brilliantly. After shelling for an evening, thumbs sore with pain from the odd stubborn pistachio that refused to open, I ended up with a good amount to try making my paste. I was aiming for a smooth paste, and I knew my food processor was not up to the task. A quick tweet and the incredibly generous Mr Franz Scheurer was quick to donate his time and his Thermomix (what would have cost me $2000 to buy). I wanted to create a pistachio paste that I could use in desserts, one that could have a decent lifespan, so I decided not to follow the ingredients of my jar of Bronte pistachio paste and instead omitted the milk. The paste would last longer, and I could add milk when I needed. To create a good paste, I blitzed the pistachios along with some glucose and created an emulsification with grape seed oil. You could use any neutral oil. I didn’t take measurements and went with feel and taste. I stopped when the pistachios tasted slightly sweet and the paste was smooth enough for me (a bit of coarse meal is fine). The consistency needs to be slightly runnier than peanut butter. I went home and mixed in some cream with a small sample to test out the flavour and the gates of heaven opened and I heard a sweet song, and a choir or angels called out to me. Seriously, it was that good. It is worth mentioning that if you want to make pistachio paste for ice cream, you may as well add some water into the blender to make the paste smoother. That way, you wouldn’t need a Thermomix, because with that much liquid, your food processor should do the trick. If you do add water, make sure you omit it from the recipe below. I was aiming for a custard based ice cream, but as luck would have it, Jules from The Stone Soup posted a churn-free, machine-free lemon ice cream recipe. It looked incredibly simple, and I decided to give it a go. The basic idea is that by increasing the amount of sugar, ice crystals do not form. Jules folds lemon juice and icing sugar into whipped cream and simply freezes the lot for 6 hours. I did the same, but substituted pistachio paste for the lemon juice, and added some water to dissolve the sugar. The result was a beautiful. pistachio green ice cream with the texture of semifreddo, light, airy and delicious. I urge you wholeheartedly to try making ice cream this way. It is so simple – 5 minutes and you’re done, and it tastes ridiculously good. Don’t you have un-shelled pistachios? I would have thought of making this a couple of days ago, before the weather turned bloody cold! But will keep it in mind for next summer! Glad to hear the thermomix strategy worked out! YUM. Want. My fondess for ice cream has only developed over the last couple of years, but gosh i like the sound of this. Fouad, this is a wonderful ice cream. Pistachio ic cream is my favorite since I was a child. I made it a couple of months ago using kefir but I must say that this one looks very tempting! Wow – great timing! I had just read the Stone Soup ice cream post the day before and was wondering how to play with it, when “ta-DAH”, here you are with a singularly seductive pistachio spin. 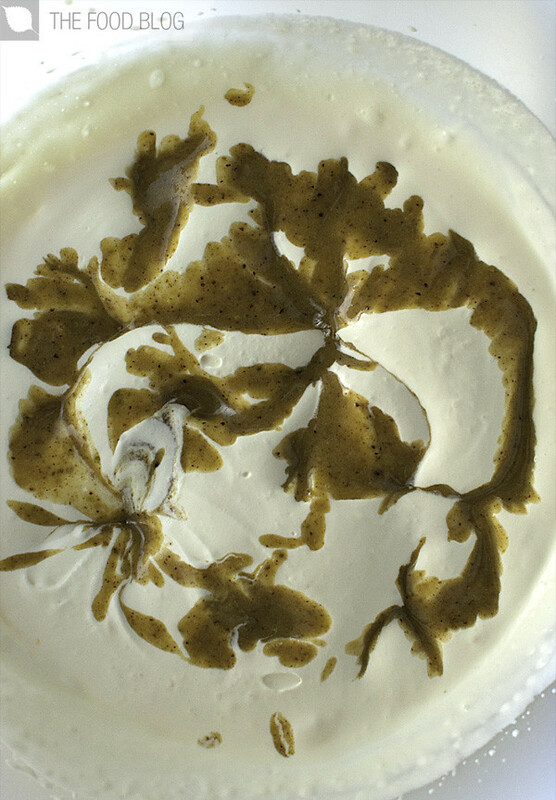 The photo of the paste on the cream is like a Rorschach ink drawing of angelic pistachio poetry. Call it what you will, but this recipe is clearly for consenting adults to make and enjoy. Glad to be of help; the paste looked and tasted great when you finished it here, so I can imagine the ice cream. Great job! And I just went and bought an ice cream maker!…Your love for pistachios is infectious Fouad! Love what you have created here…Looks soooo good! Fouad, you’ve got to stop tempting me like this. I can’t say no pistachios and if it’s there in ice cream form, it’s my first pick. Your creation looks utterly delicious! Given the price I paid for my jar of pistachio paste, I just might have this tatooed on my arm so I don’t forget the recipe!! Wow, I hadn’t realized that there were churn-free ice cream recipes out there (maybe I should have just googled…?) Anyway, realize you’d posted this up a while ago, but it’s perfect timing for me to read it now since I was planning to invest in an ice cream machine for dad. Gonna try this one out this month if I can and see how it works out. Sounds absolutely delicious, and so easy to make. I will try this shortly. Welcome to The Food Blog. Click here to learn more about this blog. 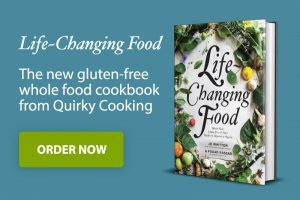 Announcement – The Food Blog is starting a restaurant!! © 2019 The Food Blog.